await. The story of the celebration is enshrined in American lore. In November 1620 a group of English Pilgrims landed in Cape Cod, Massachusetts, after two months aboard the Mayflower. They were helped through the deprivations of their first winter by local Wampanoag Indians, who offered provisions and advice. Following a successful harvest the next year, 50 Pilgrims and 90 Indians celebrated with a turkey feast. The rest is supposedly history. But history is full of half-truths, and Thanksgiving is no exception. The way Americans celebrate the holiday today—as an annual, secular event—is a 19th-century invention. The Pilgrims were a stern bunch. Holidays were scarce. Christmas, Easter and saints’ days were forbidden. Instead, Pilgrims observed days of public fast or thanksgiving. These were proclaimed in response to specific events, so varied each year. It was believed that fasting could temper a looming crisis, such as a drought or invasion, while thanksgiving marked a good harvest or military victory. Prayer was at the heart of these events. Evidence about the gathering in 1621, albeit just four sentences long, comes from a letter by the Pilgrims’ leader, Edward Winslow. Wampanoag Indians appeared along with their chief, Massasoit, “whom for three days we entertained and feasted”. Pilgrims made no mention of the event in later years (which was not a thanksgiving in the proper sense, since it involved no prayer) and relations with the Indians quickly soured. Within a generation they were at war. The Pilgrims won, and in 1676 declared a day of thanks, displaying the impaled head of Massasoit’s son—“meat to the people inhabiting the wilderness”, in the words of one Pilgrim. New Englanders continued to observe days of thanksgiving over the next 200 years, carrying the custom with them as they moved to the south and the west. The holiday assumed a semi-fixed status with time. Mostly it was celebrated as a local or statewide affair initiated by a minister or governor. It might be held in October, November, December or even January. A few national holidays were proclaimed in America: George Washington marked the adoption of the Constitution in 1789; James Madison celebrated the end of the War of 1812. But the credit for securing a fixed day for Thanksgiving, annually and nationwide, goes to an unflagging writer called Sarah Josepha Hale. She rarely alluded to the Pilgrims herself as she pursued the idea of a patriotic celebration for autumn over the course of two decades. She petitioned presidents and governors, and Godey’s Lady’s Book, her popular women’s periodical, ran editorials and moralising fiction championing the cause. Success came in 1863 during the civil war. The president, Abraham Lincoln, declared the day a national holiday after victories for the Unionist armies at Gettysburg and Vicksburg earlier that year. In 1941 Congress wrote the holiday into law, to be celebrated on the fourth Thursday in November. 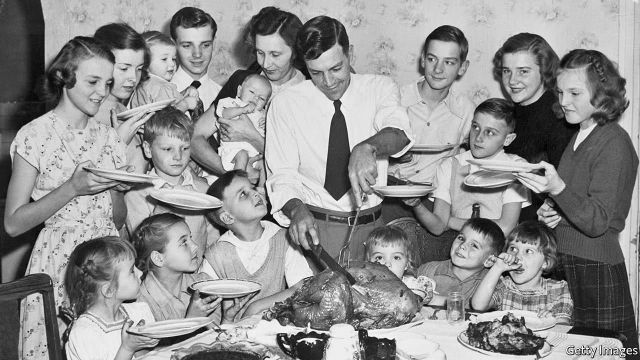 Nationwide observance of Thanksgiving meant that the holiday became an increasingly secular affair. In 1878 the New York Times complained that the day had “lost its sombreness and with that most of its religious significance.” Local parades were held, and in 1924 Macy’s staged its first. For Hale, the holiday was the “best exponent…of the prosperity and happiness of the American people”. It was a day to celebrate abundance and instil American values: patriotism, devotion to family and hard work. Never mind that the Pilgrims would have barely recognised and probably disavowed the modern celebration. What was needed was a founding myth for a young nation.